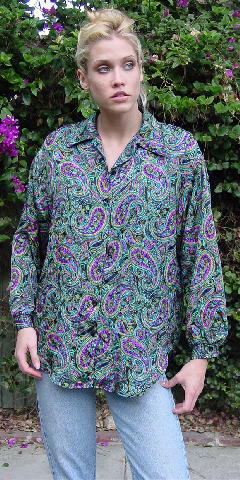 This vintage black, magenta, teal, purple, turquoise, icy pink, maize, and brick red paisley pattern blouse has 7 black buttons down the front and 1 on each band cuff. 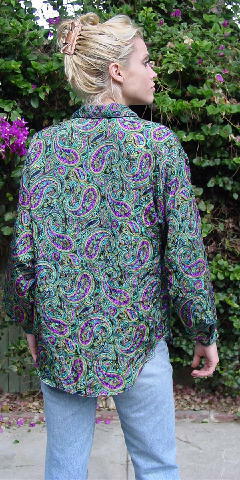 It has shoulder pads, a shirt collar, and the blouse is longer in the center (both front and back) than it is on the sides. Wear it tucked in with a suit or skirt or wear it over black pants or jeans. shoulder to end of sleeve 20"
side to side bottom side seam 21"